Indirectly relevant photo by QuietDelusions courtesy of Flickr. A burst of speed at the end of a marathon is exceedingly rare, but it happened to me once. Usually, one can’t summon late race heroics from weary muscles. But there I was at the Myrtle Beach Marathon feeling relatively fresh at mile 24. As I passed fading runners, I began to sense an excellent finish. You’ll just have to trust me. This sort of thing doesn’t happen very often. Positively ebullient, I passed the 26-mile marker, primed for excessive celebration. That’s when I saw her. As I rounded the final corner, twenty yards ahead, mercilessly taunting me by her very presence, was a white haired old woman in Asics and a singlet. She was going to beat me. But then, my practical sense emerged from the biochemical fog. Was I really racing an older woman? To be sure, she was fit and quite capable. A 3:30 marathon is nothing to sneeze at. But let’s face it, she could collect social security and something had to be done about that. As we jostled for position, I heard two distinct sounds rising from the crowd. Wild cheering overflowed for the white haired woman. Malevolent boos and derisive insults were hurled at me. No amount of hormones could save me now. Consider the unmanageable difficulty of my situation. Anyone who would pass an old woman in sight of a marathon finish is, by definition, a jackass. There’s just no way around this. However, anyone beaten by an old woman in an endurance race must be hopelessly feeble. This horrible realization makes one want to pass old women in the first place. To pass or not to pass; both options are wholly untenable. Worse, the consequence of one choice makes the other choice totally necessary, so there’s simply no way to win. It’s Heller’s Catch-22 for runners. I had only a split second to make my choice. Like any red-blooded, hyper-competitive marathoner within sight of the immortal finish line, I bolted. Grandma ate my testosterone-laced dust. In Chariot’s of Fire, Eric Liddell ran and felt God’s pleasure. That must have been nice. As I dashed forward, I could feel the mordant stares and quiet disgust of outraged spectators. As I crossed the finish line, the enormity of my blunder became clear. I had blatantly, unashamedly run down kindly Carole Findley, 66 of Raleigh, North Carolina. I felt like the devil incarnate. Carole of course, finished to thunderous applause despite struggling through the final hundred yards (I suspect she may have been playing to the crowd, but I can’t prove this.) In the finisher’s chute, I sheepishly received my ill-gotten medal. I finished the marathon with rare strength and couldn’t enjoy it, even slightly. Avoiding eye contact with the masses, I skulked away. Since then, I’ve cultivated a healthy grasp of competitive etiquette. I wish I had shown greater maturity at Myrtle, particularly in light of one painfully salient fact: Carole ran the half rather than the full marathon that day. Had I known this at the time, her 3:30 would have seemed a tad less threateningly impressive and the whole day might have gone differently. As it stood, I beat down an older woman who ran 16-minute miles (probably a personal best) in an entirely different race. And I had to kick into high gear to pass her. Even my act of strength revealed weakness. So Carole, I apologize for my callow buffoonery. I’d like to make it up to you someday; perhaps we can meet for dinner at the Piccadilly Cafeteria and enjoy Bingo afterward… my treat. I’m not a natural athlete. I recall a day in seventh grade gym class when I forgot my shorts and sneakers. I asked the PE teacher if I could run the 100 yard dash anyway. Looking upon me with prescient pity, he allowed it. Twenty yards later, the pencils and magic markers flopped out of my back pocket and I had to stop. It wasn’t the finest hour of my adolescence. The guy who “pantsed” me later would have agreed. Such is life for those blessed with an artsy, Lego-loving genetic profile. Ah, but I made up for my weedy physique with a fierce drive to out-work competitors. I’d simply “want it” more. I’ve cultivated a certain wiry stubbornness. This grit has probably made me the decent marathoner I am today. Still, I’ve not yet qualified for Boston. Taken aback by her direct question, I dribbled out flimsy rumblings about a “wall,” withering pain in my legs, and that drastically inaccurate 3rd mile marker. Then she just stared at me. Her eyes bored into mine like a penetrating sensei demanding that I, Daniel San explain why the Cobra Kai had just steamrolled me again. I responded with more verbal meandering, explaining that I did my best, fought through pain, and never, ever walked. This I felt, was perfectly reasonable. “I just don’t have enough leg strength,” I concluded. If you’ve never been looked in the eye and proclaimed the mental equivalent of a box jellyfish, you just haven’t experienced life to its fullest. You’re respected professionally, educated, and hardly ever eat fast food. Nevertheless, you’re a troglodyte. Even though you’ve run endurance races attempted by only a small fraction of the population, you’ve been declared protozoa. You’ll have to trust me here. Intensity has “more dedicated runner than you” written all over her. Somehow, I sensed that the grammar school “rubber and glue” defense would not salvage the situation. What could I say? I log 70+ mile weeks during marathon training. I run through forest trails in the dark for crying out loud. And I assure you, weather never stops me. How could she question my resolve? The mind can convince itself of anything, even that it is strong. 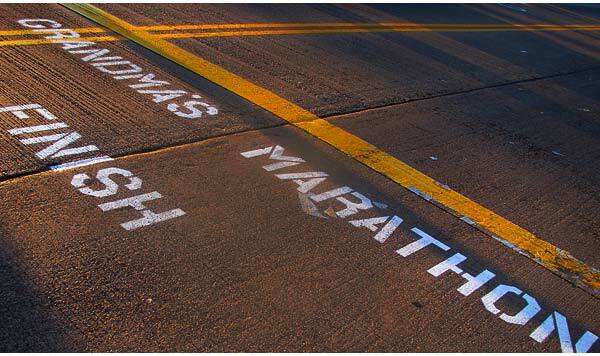 But the marathon calls the mind’s bluff. It brings commitment and focus into stark relief. It forces one to confront the true nature of determination. Worse, our brains are wired to work against us. In the latter stages of the marathon, every fiber of the body cries out for relief. The brain becomes a crisis manager, interpreting signals of exhaustion from the body as threats of imminent system failure. In turn, it sends out powerfully incessant demands to cease any unnecessary running. And your brain can be quite persuasive. It will actually send signals that mimic collapse before the actual point of collapse. It wants you to stop before you crumble. This is why mid-race you feel like death warmed over but somehow find the energy to “kick” at the finish. Your brain realizes you’re about to stop and allows a last burst of speed. This is real science, folks. Your brain tricks you. If you’re not ready for this clever cerebral assault, you will fold like a cheap lawn chair. So, I have an extremely capable, strong brain. And really, thank goodness for that. The problem lies with my mind, that small part of my consciousness that believes I can exceed my limits. My mind must conquer the ponderous evolutionary imperatives of my lumpy grey matter. Yes, it actually is mental weakness to give in to the influence of your brain. Sit in a rubber room and think about that one for a while. And so I run Myrtle Beach Saturday. My body is trained. The machine is ready. But what of the ghost within? I ran a hilly marathon under grey skies, headed toward the center of a dreary town. I recognized the blight from my youth. This was my boyhood home, Waterbury, Connecticut. Once a bustling industrial powerhouse, Waterbury boasted giant factories and the promise of modernity. It was quite literally the brass capital of the world; until plastics emerged on the scene. Today, dilapidated, empty factories dot the landscape. Like many Northeastern industrial towns, Waterbury has not truly recovered from post-World War II industrial upheaval. To the chagrin of my family, I describe the place as New York without any of the positive traits. I left at age eighteen. Now here I was, running in the Waterbury Urban Decay Marathon. That’s enough to put me on the couch, I’m sure. Early in the race, I was already expending considerable effort. Every step seemed heavy and laborious. My peripheral vision was oddly restricted. I could hear my own harsh breathing resounding in my ears. Apparently, this is what happens when you run in full medieval armor. I really can’t say if it was Gothic, Salet, or Fleur des lis. I just know it was heavy. Displaying the true grit (stubborn resignation) of the marathoner, I just trudged along anyway, worried only that my finishing time would suffer. But it wouldn’t be that easy. The course began to wind through parks, courtyards, stairs (exterior and interior), and even through offices and stores. At one point I was on a bus worried about missing a Society for Creative Anachronism joust. Course markings were perplexing to the point of lunacy. Lines painted on the road were either dotted, straight, red, white or yellow (or any combination of these) and featured symbols I didn’t understand. They cross-crossed each other, ran in parallel, and doubled or even trippled back on themselves. Runners came and went from every direction. The course looked like a Family Circus map of little Billy’s diversions on the way home to dinner… if Billy were a thirty-seven year old knight errant wannabe. Suddenly (and inexplicably) I found myself inside the magnificently austere Dawes, Tomes Mousely, Grubbs Fidelity Fiduciary Bank from MARY POPPINS. There I stood, helpless in an absurdly long teller line. Everyone else ran easily outside the rope line, crossing a mat and triggering the incessant beeping of timing chips. I feared a delay, but couldn’t get out of the velvet maze. Either that, or I really needed to deposit that tuppence. As with all dreams, details are hazy. I was parched, but paradoxically had a DEFCON ONE urge to use the bathroom. All the while, I was possessed by that feeling you get when watching Dave Bowman approach the monolith at the end of 2001: A SPACE ODYSSEY; Just plain weirded out. I won’t even mention the incident with the Pillsbury Dough Boy.